With the loss, Denver’s record falls to 37-18, which moves them two games behind Golden State for first place in the Western Conference. Denver got another great start from Mason Plumlee as the Nuggets backup center drew the start with Paul Millsap out. Even with Plumlee’s early two points, two rebounds, and two assists, the Nuggets could not slow down Philadelphia. At the 7:47 mark of the first quarter, Philadelphia led 14-6 courtesy of a 10-0 run as big runs continued to haunt the Nuggets on their current four-game road trip. Philadelphia held all the momentum until Malik Beasley started to get Denver’s offense going. 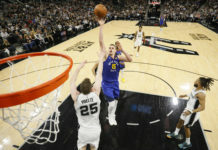 Courtesy of two three-pointers and a driving lay up, Beasley had eight of the Nuggets first 16 points as the Nuggets trailed by four with 4:04 left in the first quarter. Beasley’s play certainly provided thee Nuggets a spark, but Philadelphia closed the opening quarter on another run to grab a 33-23 lead after 12 minutes of play. In the first quarter, Denver shot just 37 percent from the field, while the 76ers shot a scorching 54 percent. That was the difference after one quarter of play as Denver had to find something offensively if they wanted to cut into their deficit before halftime. 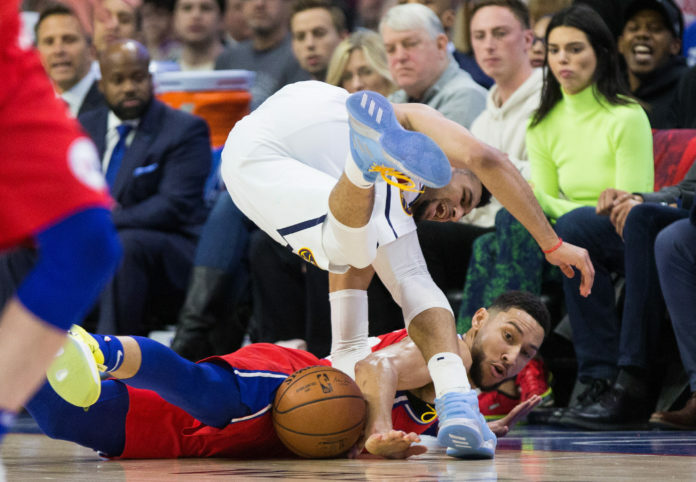 The Nuggets struggles continued on into quarter number two as 76ers sharpshooter JJ Redick was on fire. At the 8:22 mark of the second quarter, Redick was up to 16 points and was a perfect 4-of-4 from three-point range as Philadelphia’s lead sat at 12-points. The 76ers only grew on that lead as Denver trailed 50-34 with 5:38 left in the half. After a couple back and fourth minutes of play, Denver finally started to inch closer as Jamal Murray hit a three-pointer with 2:53 left in the half to cut Philadelphia’s lead to seven-points. That was the start of what ended up being a 22-6 run for Denver as they tied the game at 56 though two quarters of play. At the break, the Nuggets were led by Jokic, who poured in 14 points, hauled in four rebounds, and dished out four assists. Will Barton (12), Murray (11), and Beasley (10) were all in double-figures after the first half as well. Denver had all the momentum going into half number two, but the Nuggets inability to slow down Redick was back to start the third quarter. Redick opened the quarter with 11 of the 76ers first 14 points as he had 28 points with just over eight minutes remaining in the third. Because of Redick’s tremendous shooting, Philadelphia was back in the lead as Denver trailed 74-69 with 5:14 left in the third quarter. The Nuggets kept battling though as Monte Morris hit a floater with 2:45 left in the quarter to even the score at 76. Philadelphia was able to regain the lead to close the period, but the Nuggets deficit was just one point as the score was 83-82 through three quarters of play. Going into the fourth, Jokic led the way offensively as he had 20 points to go with his six rebounds and six assists. Murray also posted a solid stat line through three quarters as he was up to 16 points, six assists, and five rebounds. 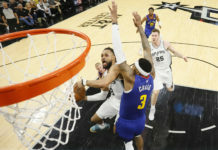 To start the fourth quarter, Philadelphia still held a one-point lead, until a Murray three-pointer with 7:48 left in the game gave Denver a 95-93 advantage. The 76ers followed that shot by going on an 8-2 run as Denver trailed by four-points with just over five minutes remaining. The Nuggets answered with a 6-2 run of their of own to tie the game back up at 103 with 4:09 remaining. Philadelphia started to pull away at this point of the game as they went on another run to take a six-point lead with just over two minutes remaining. Plumlee hit a sky-hook jumper the next possession before Ben Simmons put down a dunk that put the proverbial nail in the coffin for Denver’s chances. Philadelphia controlled the final two minutes of play to ultimately help them pickup a 117-110 victory over the Nuggets. Stat leaders for the Nuggets were Jokic, who recorded his 11th triple-double of the season finishing with 27 points, 10 rebounds, and 10 assists. Murray also had a solid game as he finished with 23 points to go along with his six assists and five rebounds. 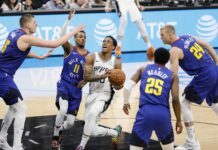 Other Nuggets who finished in double-figures were Beasley (12), Trey Lyles (13), and Barton (14), who flirted with a triple-double finishing with eight rebounds and seven assists. Denver now has two days off before they are back in action Monday night at home to face the Miami Heat.